I've hesitated to publish this story because it's not flattering to someone that we know, but enough time has passed that I hope we can all laugh about it. We don't mean to poke fun, but it does make a good story. Several years ago, I was out in our back yard hanging up laundry to dry when a young, very pregnant woman I had never seen before walked into the yard. She said she was our neighbor's granddaughter, and she had just been trained to sell Kirby vacuum cleaners, and she needed to practice her sales pitch. Would Jessie and I be available that evening for an hour or so, so she could practice on us? There would be no pressure to buy anything. I agreed. Jessie got home from work around 7pm, and I just had time to tell her what was going on when the woman -- let's call her "Leah" -- arrived with her vacuum cleaner in tow. If you've never seen a Kirby before (pictured at right), it's built like a Cylon Centurion, and it has many attachments. Despite being 8 months pregnant, she refused any help carrying the gear up the front steps and spread everything out on the living room carpet, which at the time was wall-to-wall. Leah had a script that she was supposed to work from, and she stuck loyally to its every word. It was quite long, around 15 pages. It quickly became clear that Leah was not a good reader and was not familiar with the script. Through her halting delivery and mispronunciations, we made out that the script was full of jokes, which all fell flat because we -- and she -- didn't recognize them as such until a sentence or two later. With her eyes glued to the script, she didn't see the looks Jessie and I gave each other as we gradually deciphered the writer's humorous intentions. The best part was when she talked about mattresses. Inner-spring mattresses, according to the writer, start out hollow but gradually fill up with "dead skin cells, or what scientists call 'rotting human flesh,'" to the point that you might as well have an entire festering corpse inside your mattress! But the skin cells don't stay that way, no... they attract dust mites, which leave their fæces behind. Leah was unfamiliar with the word fæces and pronounced it "faces," so the writer's line, "Just think of all those fæces!" became, "Just think of all those faces!" Ever since then, it's been a running joke for Jessie and me to imagine all the poor, sad little dust mite faces left behind in the mattresses. Between Leah's slow reading and inexperience with the equipment, the demonstration lasted much, much longer than the hour we had agreed to; closer to two and a half hours. The grand finale was the shampooing attachment, which for some reason did not produce the dry foam that was intended but a very wet lather that bubbled out of control and would not clean up. The carpet was still damp a week later. But then we had to talk about pricing. 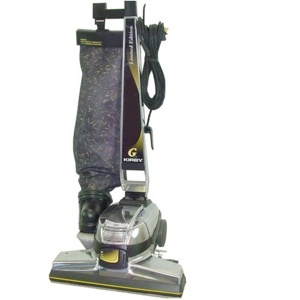 Kirby vacuums are expensive, and the financing plan makes them much, much more so. You could easily buy a used car for less and get a much better loan. After the bungled demo, we were not at all inclined to buy. We thanked Leah for her time and wished her luck. As far as we're aware, she did not last long in that sales position.